Dogwoods have long been cultivated for their showy flowers and fine-grained wood. Recently, the market value of dogwoods has increased as demand for woody ornamentals grows in the U.S. To advance the breeding potential of these economically and culturally important trees and shrubs, scientists can use genetics and advanced genomics to study critical agronomic traits such as flowering time, flower characteristics, disease resistance and stress responses. The Dogwood Genome Project, led by researchers from University of Georgia, University of Tennessee, and North Carolina State University and funded by the National Science Foundation, is generating a reference genome sequence for the flowering dogwood clone (Cornus florida 'Appalachian Spring'). The Dogwood Genome Project will use phenology observations collected through Nature's Notebook for both native flowering dogwoods and cloned dogwoods by investigating the genes that may be influencing the timing of leaf-out, flowering and leaf-fall. Understanding the genetic basis of these phenological traits will help breeders develop varieties that are best suited for particular growing zones. See what Nature's Notebook participants reported for dogwoods in 2013 and 2014. 1. Join Nature's Notebook. If you haven't already, create a Nature's Notebook account. See our specifics of observing if you need more details on getting started. 2. Join the Dogwood Genome Project. During registration, check the box next to the Dogwood Genome Project - UGA, under Colleges and Universities in the Partner Groups list. If you have already registered a Nature's Notebook account, go to your Observation Deck, click the link to My Account Details, and add yourself to the group. 3. Check your Observation Deck. Under Sites you will be able to switch back and forth between My Sites and Dogwood Genome Project Sites. 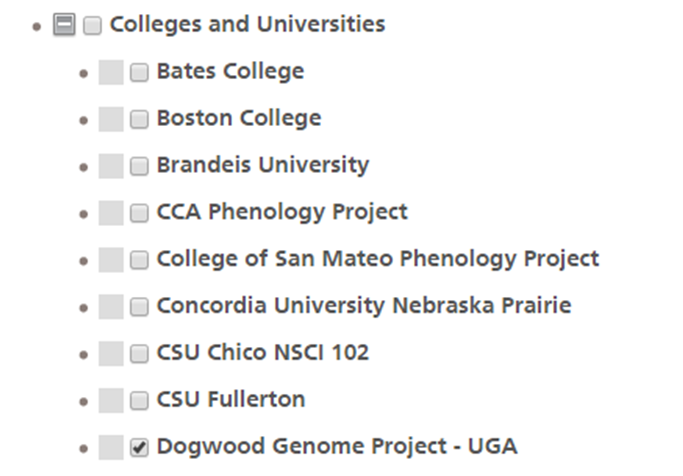 To submit observations for one of the Dogwood Genome Project dogwoods, be sure you select Dogwood Genome Project from the dropdown and you will see the sites for the group. 4. Learn more about the specifics of observing cloned dogwoods. 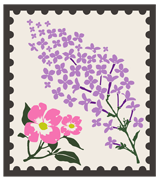 You can earn this badge by joining Nature's Notebook, planting a cloned lilac or cloned dogwood, and observing it in six separate weeks, within the same year.